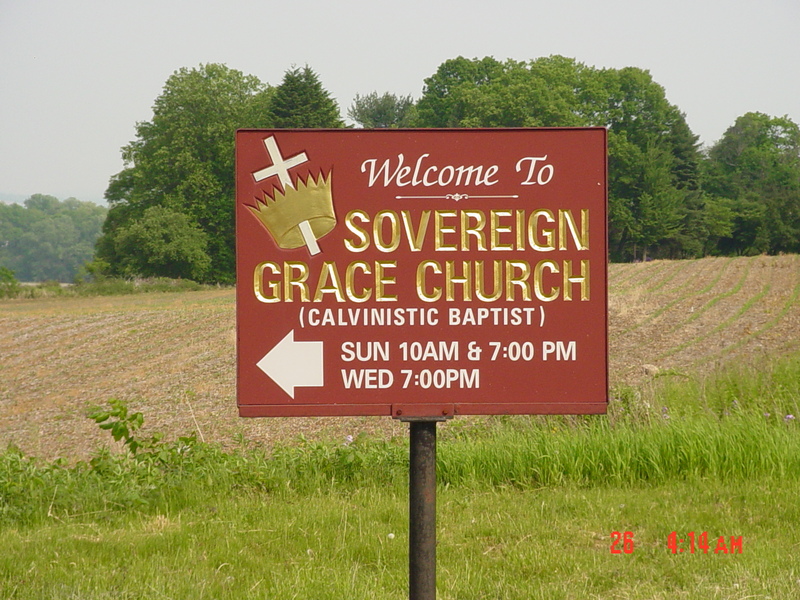 SOVEREIGN GRACE BAPTIST CHURCH - Welcome Home! * Are you seeking a place where you can find hope in a world that has gone mad? * Are you looking for answers to life's problems? * Are you searching for genuine faith in a "politically correct" culture where no one stands for anything anymore? * Are you interested in a church home where Christ is worshipped in Spirit and in truth? * Do you need a church where fellow Christians will encourage you and help you to grow in grace and knowledge? * Have you felt God's call to search for a deeper and more vibrant living faith? * Did you ever wonder what all of the books of the Bible really tell us about God? By God's amazing grace, we can help! While we very much appreciate your taking the time to visit our website, please note that the content herein is in no way intended to replace or substitute for local worship. As Christ's glory is in His Church, every Christian has the obligation & privilege to seek out a local assembly of believers for the purpose of worship and edification. If you are in our locality, you are welcome to join us. Otherwise, we strongly encourage you to seek a Bible-teaching, Christ-honoring church in your vicinity. who received the New Testaments with Psalms & Proverbs will read and apply the Word of God in their lives. We celebrate 10 years on the Web! With over 65,250 hits on our homepage, & 55,285 downloads of the 56695nline messages, we trust the Lord's promise that His Word will not return void ( (Isaiah 55:11). On June 18, 2015, Pastor Raymond C. Ruch, Sr., 88, went to be with the Lord. 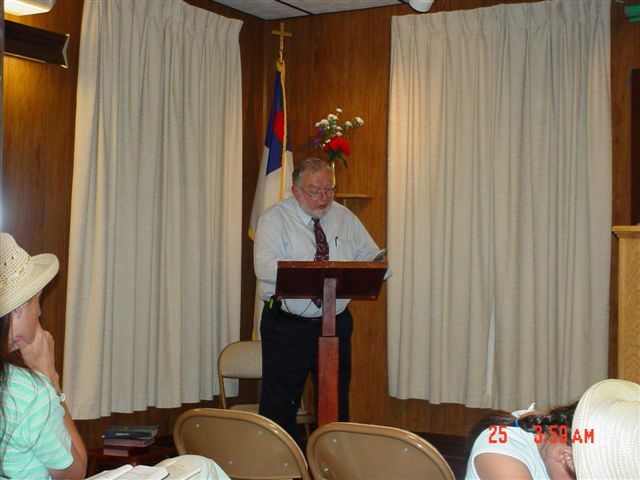 He had preached alternate Sunday evenings at SGBC for more than 20 years. Our prayers go out for his wife Betty & the family. Early in the morning of May 3, 2015, our Senior Pastor William P. "Bill" Robbins, who had faithfully preached the Gospel and fed his flock at SGBC for the past 46 year, went to be with the Lord. He was 80. You are invited to send condolences to the family at sgbc@localchurchpa.com or on the Prayer Requests/Condolences tab above. In lieu of flowers, please consider donations to the SGBC Benevolence Fund tab above. We are truly blessed to have known Pastor Bill and anticipate seeing him again in eternity. Celebrating the international reach of God's Word through the SGBC website: According to Google Analytics, of the 140 visitors to our site in July, 2014, 91 of them were from the U.S., 23 were from Brazil, 5 from the Philippines, 2 from Canada, and 2 from India. We invite thos who visit the site to offer some feedback at sgbc@loocalchurchpa.com. You are invited to take our latest poll (Biblical Baptism?) on our CONTACT US page. Check out the BIBLE STUDY TOOLS tab on the menu at the top of the page for an easty-to-use Bible Verse search engine, including various commentaries & Bible dictionaries! Now you can donate to Sovereign Grace Baptist Church by PayPal! See the button on our "Cheerful Giving" tab above! Thank you! A very informative message in a special DVD Presentation! See the video at our Facebook link (Sovereign Grace Baptist Church at Muncy) We witnessed "Out of Islam: My Journey to the Truth", the testimony & story of Dr. Daniel Shayesteh, author of "Islam: The House I Left Behind" as hetells of his conversion to personal faith in Christ & reveals the realities behind Islamic theology and sharia law. A powerful witness of God's sovereign grace in the salvation of a high-ranking Iranian politician, trained terrorist & co-founder of Iran'sIslamic Revolutionary Guard! MissionaryVisit! Bert Craft, missionary to Mexico, with his wife Heather & 7 children, visited SGBC & preached in the morning worship service on June 12. He provided an update on the work of the Gospel in Oaxaca, Mexico, & preached "on exalting the Name of the God who calls men & women to repentance by His sovereign grace. SCHEDULE CHANGE!!! For the present, the elders have decided to move the Wednesday Bible Study & Prayer Meeting to Sunday evenings. The church will not assemble on Wednesday evenings until further notice. Check out SGBC on Facebook! Search keywords "Sovereign Grace Baptist Church at Muncy" for latest news & updates! FREE CDs! 6 selected CDs of worship services & Bible teaching have been edited & produced for distribution as part of evangelistic outreach & invitation to visitors to Sovereign Grace Baptist Church. They will be dispensed individually or mailed in efforts to spread the Word of God by all possible means. Listen to the 8-part WAY OF THE MASTER series on personal evangelism! A Biblical foundation for witnessing based upon God's Holy law & man's sinfulness. See Message Share section at the bottom of this Homepage! If you cannot join us for worship services, please scroll down this page to the MESSAGE SHARE section, where you can play 434 sermons online, or download them to an mp3 player or other audio device. Additionally, you can email to a friend any sermon which may have been helpful to you. Check out the other pages on this site for more information about Bible truth & how God is working in this local church!